The Oxford Reverb plug-in is a highly flexible stereo reverberation generator, designed to complement existing Sonnox Oxford applications in providing the user with the highest technical and sonic performance coupled with artistic and creative facility. As well as providing stunning presets, the user has full control over all of its many parameters, including a very comprehensive early reflections section, and integrated 5-band EQ. 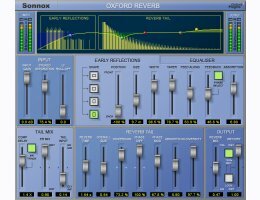 The Sonnox Oxford Reverb allows the powerful facility to create virtual spaces freely, depending on artistic need, ranging from dry reflection ambiences, room and hall simulations, sound effects, all the way to wide open reverberant spaces with a very large range of possible texture and spatial character. By avoiding fixed algorithms and providing user control of all parameters, the Sonnox Oxford Reverb allows the professional engineer the powerful facility to build virtual spaces freely depending on artistic need, ranging from dry reflection ambiences, room and hall simulations, sound effects, all the way to wide open reverberant spaces with a very large range of possible texture and spatial character. Highly flexible reverb generator plug-in with real-time continuous control of virtually all parameters. Dual independent paths for both ï¿½Early Reflections' and ï¿½Reverb Tail' function. Each reverb path type can be used independently or in combination. Comprehensive 5 band equaliser (based on the Sonnox Oxford EQ) which includes high and low pass filters. More than 120 snapshots for immediate use under the headings of Dry Spaces, Ambient Effects, Vocal Reverbs, Plates, Rooms, Chambers, Halls, Churches and Foley Effects. The INPUT GAIN fader sets the level of signal fed into the reverb process. The STEREO SEPARATION fader allows the left and right signals to be mixed in order to reduce the stereo width, with variation from full stereo to mono. The LF ROLL-OFF fader allows reduction in low frequency content for the signal passed to the reverb processor, but does not affect the dry signal. When set at 0.0, the low frequencies are completely unaffected. Four SHAPE buttons allow basic 'virtual room spaces' to be selected. The POSITION fader selects the listening postion on a central front to back axis. The SIZE fader sets the front to back distance for the room. The room proportions remain as the size is adjusted. The WIDTH fader sets the stereo separation of room reflections with normal placement at 0.0%. Separation is increased from normal, going ultra-wide beyond 100%. The TAPER fader controls the loudness of reflections in relation to path lengths. Lower settings will cause more distant reflections to be quieter, whereas at maximum, all reflections will have equal level, irrespective of path lengths. The FEED ALONG fader sets the amount reflection density and echo complexity due to re-injection of distributed sound within the simulated space. The FEEDBACK fader sets the proportion of reflected signal that is re-circulated. The PHASE SELECT button selects the phase of the feedback and its diffusion, characterised as softer or harder reflections. The ABSORPTION fader controls high frequenxy roll-off, where increased absorption is reminiscent of soft furnishings and drapes. The COMP DELAY fader sets the time after which the the reverb tail starts. If the ER TRACK button is selected, then it tracks the early reflection room size exactly if the fader is set in the middle. Variation from 0.1 and up to X 2 the room size is available below and above the central X 1 setting. The ER MIX fader provides a x-fade mix between the dry input signal and the output of the early reflections processor. The TAIL INPUT fader is the final x-fade mix which feeds the reverb tail processor. It takes signals mixing between the COMP DELAY fader output and the ER MIX fader output. The REVERB TIME fader sets the time in seconds for the reverb signal to drop to -60dB. The OVERALL SIZE fader, independent of reverb time, sets the build-up and density of the reverb tail. Larger size settings cause a slower density build-up, whereas for smaller settings, the build-up is much faster with greater long term tonal artifacts. The DISPERSION fader controls the rate and build-up of dispersion behaviour, character and sonic texture over time. Positive values increase dispersion and negative values also increase dispersion, but with greater left/right differential. No dispersion effect takes place with the fader set centrally. The PHASE DIFF fader operates in conjunction with dispersion, controlling the speed of build-up of differential phase components. Positive values create more coherent dispersion components, sounding smoother and more natural. Negative values create wider range dispersion where some components have inverse polarity, which tends to extend the sound field. The PHASE MODULATION fader controls time related variance to the to the reverb character for enhanced realism. The ABSORPTION fader controls high frequenxy roll-off, hardness and sofrtness, where increased absorption is reminiscent of soft furnishings and drapes. The DIVERSITY fader provides control of front centre weighting which helps to anchor the reverb to centre stage. The lowest value gives the greatest centre weighting, narrowing the reverb, whereas maximum diversity spreads the reverb spacial effects equally across the sound stage. The REVERB MIX fader x-fades between the early reflections process output and that of the reverb tail process. The WET/DRY fader x-fades between the dry signal and the complete reverberation processing. The 100% WET button selects the output of the reverberation processing only. Clicking on the EQUALISER tab reveals the EQ controls. The EQ processing preceeds just the reverb processor, and has no effect on the dry signal. Each of the 5 sections allows control of GAIN (boost & cut), FREQ(uency) and Q with 'bell' characteristics. In addition, the LF and HF sections include 'shelf' and filter functions. An IN button on each section allows the effect of its control settings to be auditioned.